I can't believe it! It has been a very busy morning for me as I have decided to make the most out of whatever time I have. For the past three weeks or so, we didn't do any grocery shopping. As a result, we had to eat out most of the time, and it really made us broke. So this weekend, I decided to go to the supermarket, stock up, and make sure that I cook every day. It's day 2 and I am doing great so far. Anyhow, as I was making pan-fried tilapia fish fillet for lunch and some concoction with pork, broccoli and baby corn for dinner, a thought hit me. I wish I could just do it every day! I mean, I want to be able to prepare our meals without rushing. I want to be able to do stuff at home without having to hurry to work. I still want to work, but just my writing and at home. 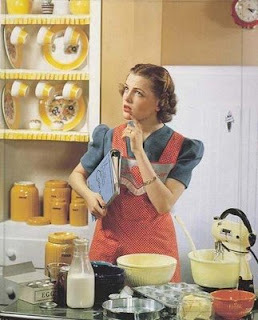 In short, I want to be a (semi) housewife. You seem to have "nesting syndrome" and that can be a good thing. Glad you are enjoying cooking. I did a bunch this weekend and that is unusual for me. I usually only want to cook in the winter when it doesn't matter if you heat up the kitchen.